In today’s global world, change is happening at breakneck speed. Fluidity and interdependence are the name of the game. The imperative to connect knowledge with action in order to harness a sense of common purpose to imagine a better life for the majority of human beings on the planet has never been greater. Our growing consciousness of global connectivity is intricately associated with a set of complex social processes that we have come to know as globalization. Far more than the simple phenomenon of people, ideas, and goods moving easily across borders since the Age of the Silk Road, globalization in the 21 st century has become both buzzword and contested concept at once. It involves rapid social change occurring simultaneously across a number of inter-connected dimensions – in the world economy, in politics and international development, in communications and technology, in the physical environment and in culture. It impacts every facet of our lives. The fall 2018 kicks off the series with an examination of these questions and more with two public events. 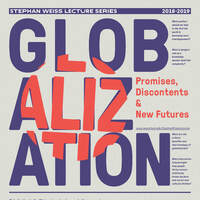 The conversations feature practitioners, activists and scholars that will delve into critical areas where both the current benefits and shortcomings of globalization run deep.